1. There are 3 crucial people you need on your team: An Attorney, a CPA, & an experienced Business Mentor/Advisor. They will help you avoid making serious mistakes with your business that can have major financial or legal consequences. 2. 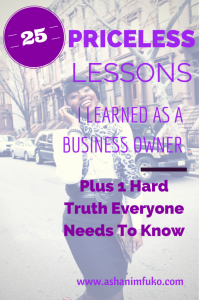 Just because you CAN start a business with little or no money, doesn’t mean that you SHOULD. Similar to buying a house with no money down, it’s a bad move. You need a nest egg. Whether you get it from friends & family, investors, grants, or your own savings, you NEED TO HAVE MONEY TO START YOUR BUSINESS! It takes time to get a credit line at your bank, or a business credit card. Have cash tucked away to help you during those first 2-3 years. Disclaimer: If you’re starting an online business that requires little to no overhead, you may be able to get it started with very little cash. If you do this, still have a cash reserve set aside to cover your business expenses i.e., taxes, incorporating fees, website design and maintenance fees, etc. Treat your online business like a business, even if it doesn’t have a brick & mortar location. 3. Your business will evolve. If you want to offer a broad range of services, don’t create a name around your services. Create a name around your mission/purpose. The former may change, the latter probably won’t. Most people have no clue what owning a business truly entails. The fantasy and the reality of owning a business are very different! 4. Just like in dating, your first business may not be “The One”, and that’s okay. Know when to hold ‘em and when to fold ‘em. You will learn from the experience either way. 6. Don’t wait until you have something to sell or promote to build your brand on social media. Connect with people on social media on a daily basis. Build trust and beneficial relationships by sharing your passion, expertise, time, and friendship. 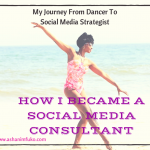 Get accustomed to how the various social media platforms work, and learn how to navigate them with purpose. You will need those skills once you start your business. 7. When collaborating with key players in your industry, or soliciting sponsors, BRING SOMETHING VALUABLE TO THE TABLE! No one likes a person who only wants to receive, but has nothing of value to give. Be strategic! Make it a win-win for everyone. 8. Keep your business life and your personal life separate. Treat everyone with love and respect. When working with your friends or family, let them know that you expect the utmost professionalism from them, at all times, and make sure you follow suit. 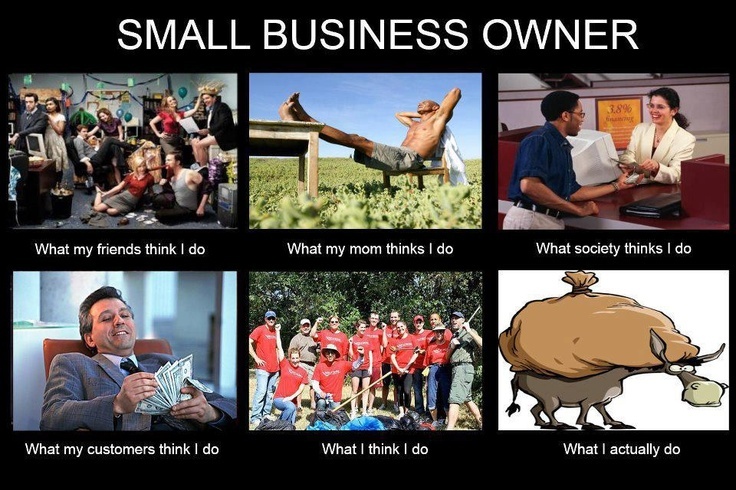 Small business owners are some some of the hardest-working people in the world! 9. Have standards, and don’t sell yourself short. If you let people take advantage of you, they will happily do so, with no remorse. You teach people how to treat you. 10. You can’t do it alone! Know when to enlist the help of others, and get help however you can. Ask family and friends to volunteer their services (short-term), barter, hire interns (h.s. or college students), hire a virtual assistant, etc. Get creative! Get help so that you can focus on doing what you do best! 11. Be inspired by other successful business owners, but NEVER COMPARE YOURSELF TO OTHERS! You are UNIQUE! You are DIFFERENT! You are YOU! No one can do your business better than you! Focus your energy on being the best that YOU can be, and forget the rest! 12. ALWAYS pay your team/employees/vendors ON TIME!! DON’T BOUNCE CHECKS! Nuff said! 13. Tell your team how much you appreciate their hard work and dedication to your business on a weekly basis (at least). Find something every week to recognize and thank them for. Showing people gratitude and appreciation will get you VERY far in the long run. 14. Do something special for your team once-a-month. Surprise them with lunch, a gift card (even $5 is appreciated), a hand-written thank you note, whatever you can think of to make them feel special and appreciated. If you have a great team, and you want to keep them, all of these “little things”, will actually make a huge difference. Remember, your valuable team members more than likely know how valuable they are, and so does someone else. Don’t let them be persuaded to take their value elsewhere because you took them for granted. 15. Learn how to negotiate. If you’re going to own a business, you need to master the art of negotiating. Do whatever you need to do in order to become masterful in this area. Read books, take classes, pray, build up your own self-confidence, take a kick-boxing class (okay, I know that’s a reach). Do WHATEVER you need to do to get to the place where you’re a comfortable and confident negotiator. 16. Know your worth. Don’t be one of those business owners that low balls the price of your products and services because you want to be “affordable” for everyone. Know your value. If you are bringing years of experience and higher education, or specialized skills to the table, your rate should reflect that. If your product takes you 15 hours to create, because it’s custom-made, or hand-made, then your price should reflect that. You don’t need to appeal to everyone. Your product or service is not for everyone. It’s for that specific group of people who will see the value in your product or service, and be excited to pay for it as a result. 17. Be patient. Building a successful business takes time. Plan for it to take at least 3-5 years (of hard work and diligence) before you start to turn a profit. 18. Spend your money wisely. It’s very tempting to spend every dime that comes into your business bank account, but this is very dangerous!! Always pay yourself first, and save a portion of your revenue, after you pay your taxes. Then take the rest and reinvest it back into the business. 19. Keep your job (or a few jobs) while you grow your business for as long as possible. You will still need to have a steady income as you grow your business in order to take care of your personal bills, expenses, and debt. You can not count on your business to support you financially for the first few years. It will need you to support it. If you can’t run your business AND work another job, then you need to save up at least 2 years-worth of your annual salary BEFORE you start your business, so that you know that you will be able to survive, and not go deep into debt, due to starting a business. 22. Starting a blog will do more for your business than almost any other form of marketing. Attracting the right customers and standing out in the marketplace, are two of the biggest challenges you’ll face as a business owner. 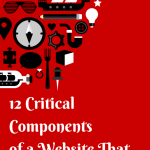 Creating a blog that provides high value to your target audience while showing your expert status in your niche, can be even more effective than paid advertising. Show your customers that you are the go-to expert in your niche, use your unique voice, and get personal on your business blog. Share your story, your experiences, and offer free tips, advice, and resources geared to your target audience. 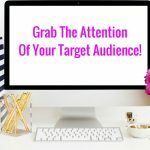 The best part of blogging is that it gives you access to a HUGE audience, as well as many amazing business opportunities. When people start sharing the awesome content on your blog on social media, new customers will be the tip of the iceberg! Get ready for the potential of media coverage, public speaking opportunities, television appearances, business partnerships, and much more. 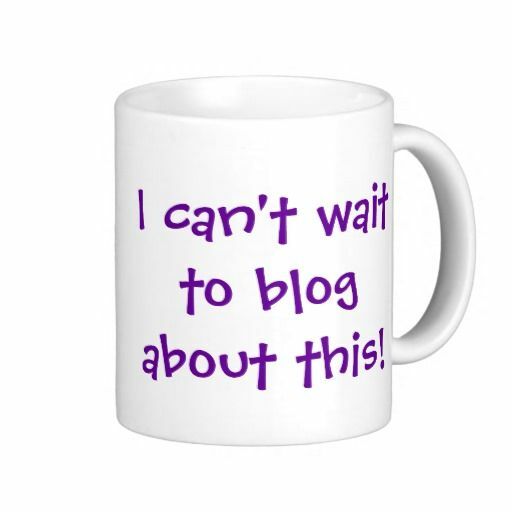 Start your business blog! 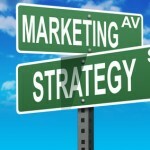 It is a POWERFUL marketing tool! 23. Get ready to work harder than you’ve ever worked for anyone else. 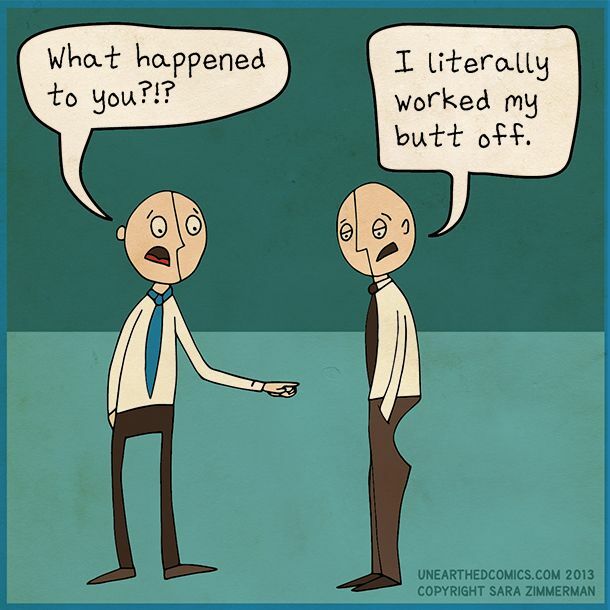 My Ah-Ha moment came when I realized that I am an extremely hard worker. I decided that, if I worked as hard in my own business, as I did for other people, I could be very successful. But the truth is, no matter how hard you work for someone else, you will always work about ten times harder in your own business. Business owners tend to work around the clock, on weekdays, and on weekends. Just be sure to create balance in your life, and don’t let the passion for your biz take over your entire life. 24. Lead with love, honesty, and integrity at all times. Let’s face it, you’re gonna have to deal with some difficult people from time to time. There will be people who try to cheat you, disrespect you, and scandalize your company’s reputation. No matter the situation, always lead with love, honesty, and integrity. Don’t let anyone change you! Honor God in every situation. He is your vindicator!! 25. Pray for Godly wisdom every day. You can get an MBA and have the best legal counsel in the world on your side, but without God’s wisdom, you are destined to fail. Even if you build a successful business, without God’s guidance, you won’t have the total package. You want to make sure you honor God in your business every day. You want to experience personal fulfillment, live out your God-given purpose, and make sure that you’re loving people the way God loves them, and not just living life on your own terms. 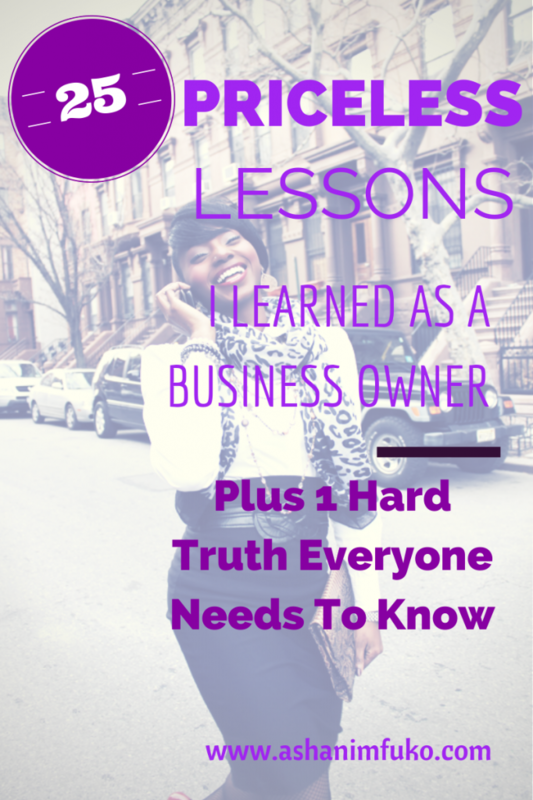 Not to mention, owning a business is very stressful, and requires you to make tough decisions on a daily basis. You don’t want to face all of this alone. Go to God and seek Him every single day. Godly wisdom is truly priceless!! 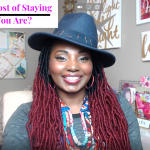 If you are lazy, unmotivated, are looking to make some quick, fast cash, leave a job you hate, or you strongly rely on the stability of a steady paycheck, then starting a business right now is probably not for you. If you want to build long-term wealth, a legacy for your family, make a positive difference in the world, pursue your passion and God-given purpose, create jobs, have financial freedom, and build a life that you love, then STARTING A BUSINESS IS FOR YOU!! Do you want to start your own business? What obstacles are you facing in starting your own business? Are you a current business owner? What advice would you add to this list? Post your reply in the comments below!